Buzz Study is a blog maintained by software company infegy. Their social media product, Social Radar, is a social media tracking tool. To promote their tool, they produce a monthly Top 50 Social Brands list that is now being accompanied by a first ever Top Social Automotive Brands report (U.S. market only.) The first example was published Tuesday. You can see it here. How are brands measured? Well according to Buzz Study the Top Automotive report uses the same methodology as the Top 50 report they publish. "To create the Top 50 list, we used Social Radar to analyze millions of blog posts, news feeds, forums, social networks and Twitter posts to aggregate a list of the words and brands mentioned most frequently on the Web during April 2009. The list measures the number of unique individuals or sources that posted content about each brand during April 2009 rather than the overall number of mentions, which would be more heavily influenced by big fans who post frequently about a specific brand." One of the things Buzz Study doesn't mention about their ranking is what significance there is of having a top ranking? There is no sentiment study posted showing if buzz is good or bad. You only simply learn if there is a lot of discussion going on across the web. In Chrysler's case, this probably isn't a good thing. Ford came out on top in the automotive brands and #25 on the all brands Top 50 report. 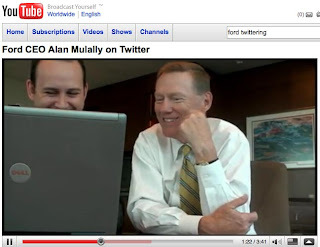 When your CEO is on YouTube Twittering with his Head of Social Media Scott Monty, it isn't that surprising. Plus there are some big campaign pushes in the social space, like The Fiesta Movement. Brands with very few owners, brand advocates or an older customer will likely not improve much on this list. Also, brands with very limited marketing budgets or no new product news will place low too. That's probably why we see brands like Buick, Mercury, Lincoln, and Suzuki at the bottom. The surprising one at the end of the list is Infiniti which has a very hot, buzz worthy pool of products like the G37 and FX. This just shows that Infiniti isn't really investing in this space and is not part of their media mix right now. One trite example I did was Google "infiniti social media", one of the top spots for the automotive brand is a G20.net enthusiast site. If you don't know, Infiniti hasn't made the G20 for seven years. Point made. On the other hand, BMW has been very active on Facebook, iPhone (yes I knew iPhone is not social media, but doing things on iPhone generates social media buzz) and has a large amount of brand oriented blogs, even one that I run. Sorry had to promote my other blog for a second. BMW hasn't made any push into Twitter, showing that you don't need to be in every social media environment to have an impact. It is an interesting report and could be a data point to see how large-scale social media marketing efforts by automotive brands can impact their ranking on Buzz Study's report; though, I'm sure infegy would rather you just purchase their social media tracking product to analyze your efforts.